The scoring exploits this season of 19-year-old Stan Cleal have caused considerable interest. He has been the outstanding performer in league cricket and to mark this success he was presented with a bat which was donated by England and Kent batsman Colin Cowdrey. The famous star gave the bat to Mr FE Stroobant, the former GCL president, and asked for it to be presented to a deserving cricketer. Stan Cleal was the obvious choice. The Island Cricket Selectors have nominated the team to represent Guernsey against Jersey at the College Field next Thursday. They have made at least one shock choice. He is Peter Burgess the Harlequins’ batsman who starred in his first senior representative game at the Memorial Field on Thursday – the day the selectors met – scoring 37 runs to ensure the GCL’s victory over GICC. Burgess is a very stylish player, possessing the most attractive cover drive in the local game. The team is: VG Collenette (capt), AM Hunter, RD Self, P Burgess, AC Bisson, MI Lloyd, WER Barrett, WF Druce, P Le Cocq, M de L Hart, RCN Roussel. The selectors were faced with a difficult assignment. There are perhaps seven or eight ‘naturals’ for the Guernsey side with possibly another dozen of similar standard. For this reason there is bound to be criticism of the selected side. It will be argued that Burgess is fortunate to get in on one showing; that Hunter, Collenette and Self are not at their best just now; that Druce who will keep wicket – has not had a great season. In the same way it will be said that College opening batsman Sarre and experienced John Martel and Tobias are unlucky to have been overlooked. The Guernsey cricket side did come off against Jersey at the College Field yesterday and the result was a superb 38-run victory. Strong in every department the Guernsey players fulfilled the selectors’ hopes by producing their known form at the right time. It was a grand day’s cricket on a wicket that helped bowlers but also enabled the batsmen to make strokes. The Guernsey side thoroughly deserved their victory and never looked like losing. They were made to struggle for runs against some grand Jersey bowling but, in the end, won through to make the very respectable total of 178. Jersey were not left with as much time to make their runs but their target was certainly not too great to justify them playing for a draw. From the first over it was obvious that this line was furthermost from their minds for they attacked steadily and, even at the close, were still going for the runs. Collenette won a good toss for Guernsey and Bisson and Burgess faced the medium-paced Jersey attack and looked quite confident when Burgess, playing in his first ‘big’ game in the island, slashed at a fast rising ball well outside the off stump from Grantham and Le Marquand rook a lovely catch behind the wicket. Lloyd joined Bisson and between them they gradually got on top of the consistent bowling. Jersey captain replaced Carter at the Rue a l’Or end and Bisson welcomed this with a beautiful on-drive to the boundary. Grantham continued to bowl well at the other end and when, after an hour, he was replaced by off-spinner Vic Newton, one felt he had earned his respite. But he was far from finished yet. He immediately took over at the other end and his fine bowling was rewarded with the wickets of both Bisson and Lloyd. Bisson, who had batted really well, was the first to go. He had just hit Grantham for the best boundary of the game up to that stage but played and missed at the next delivery and was bowled. Then Lloyd tried to ‘tickle’ the ball down the leg side and there was the brilliant Le Marquand to take another grand catch. Undaunted by these reverses Roussel and Barrett attacked the bowlers. Roussel off-drove Newton for two cracking boundaries and Barrett used his feet well to drive Grantham for six. The 100 was raised in just over equal time and at this score Roussel was dismissed – bowed by the ‘nagging’ Newton. At lunch then the Guernsey score was 100 for four. Soon it was 100 for five, for in the first over after the interval Barrett failed to get over a delivery from Grantham and gave Knight an easy victory at mid-off. Again Guernsey had to fight back to retrieve their position. And this Self and Hunter admirably did. The following 45 minutes were a little dull to watch but the batsmen were taking no chances. Hunter looked the more confident of the two but Self surged ahead of him with four smashing boundaries. Hunter then opened up with a six and a four to square leg off successive deliveries from Carter and Guernsey had regained their lost initiative with a vengeance. After this pair had put on 62 valuable runs Self was bowled hitting out and the remaining wickets fell in quick succession as the other batsmen followed suit. Hunter was out from one of the game’s biggest hits – a shot to mid-wicket which would have been a six on most pitches! Grantham’s bowling gained praise from all. Half his 22 overs were maidens and he took for good wickets. Jersey were left with 145 minutes to get the runs – Guernsey having taken 200. Newton immediately produced his strokes and was soon in double figures. He gave a chance at gully, which Lloyd grounded, but soon afterwards was ‘leg before’ to Hart, having scored 21 out of 30 for the first wicket. Le Marquand also hit to good effect, a highlight of his innings being a wonder-hook off Le Cocq. Before this, however, the Guernsey bowlers had got on top and half the side was out for only 78. The only real resistance suffered after Le Marquand was bowled was Grantham. The standard of his batting was at least as good as that of his bowling. Despite the fact that he was well down the order and fast running out of partners, he still kept the scorers busy with some beautiful shots and it was a disappointment to most when he edged a Le Cocq delivery before completing a well-deserved half century. ‘Gallant failure by Jersey against Guernsey’s superiority’ by ‘Star’ reporter. There was no doubting Guernsey’s superiority over Jersey in Thursday’s Inter-Insular cricket match at the College Field. Their 38 run victory was a great achievement – a triumph for the players and the selectors. The ‘wise men’ came under fire when they named players who were obviously out of form. But these came out on top and played a big part in the victory. It was a grand match to watch. Play was slow at times but always interesting. Guernsey were strong in every department – even though some players blotted their copybooks by grounding some simple-looking catches. Jersey, on the other hand, were good only in the field. Some of their batsmen played some beautiful strokes but in the main the batting was not as solid as Guernsey’s. The star of the day was a Jerseyman who was not in the selected side. He was David Grantham. Coming in for Gordon Newton he bore the brunt of the bowling and did an excellent job taking four for 55 in 22 overs. Seven of his fist nine overs were maidens! Later he came in to bat when Jersey were struggling and proceeded to hit a splendid 42 runs. He had to force the pace against bowlers who had been dictating play and on top of this had the nagging fear that he would run out of partners. His grand innings maintained interest right to the end when his wicket fell Jersey were 38 runs behind with 13 minutes to go. The Jersey players certainly did not waste time getting the runs. They were asked to score at the rate of over one a minute and in fact got their runs in even time. Another Jersey star was Brian Le Marquand. He gave a most competent display behind the wicket, taking two fine catches and hit a lovely 31 runs in an innings full of attractive strokes. Vic Newton spun the ball a great deal but managed to gain only one wicket in a 16 over spell. He was another Jersey player to hit form with the bat. But these were the only three. Guernsey’s batsmen were nearly all successful. A great deal was asked of Peter Burgess who opened with Alan Bisson. Burgess, essentially a stroke player, kept his head down for a while but could not resist a short, sharp rising ball outside his off stump and flashed at it giving the wicket-keeper a difficult chance which was accepted. Burgess had made only one at this stage of a Guernsey total of 11. It was not a good start. It meant that Ian Lloyd had to take over the grafting with Bisson. And this they did very well. Bisson scored at every opportunity without taking risks – Lloyd was more easily contained. Bisson hit a beautiful on-drive off Grantham but was bowled next ball but Guernsey had 65 runs on the board at this stage. Lloyd then became more aggressive, particularly against Newton, and when he was well caught by Le Marquand down the leg side off Grantham, Robin Roussel and Warren Barrett took over. Roussel drove Newton brilliantly on two occasions and Barrett, showing his best form, stepped forward to smash a Grantham delivery for six to long on. The batsmen looked on top at this stage but when Roussel was out just before lunch and Barrett immediately after the break the position changed. But again Guernsey had the batsmen to recover the initiative, Roger Self and Alan Hunter – two of the players who did not get in on current form – got their heads down. The former looked more comfortable and one wondered if Self was in for another bad innings. He looked out of touch – missing even with his favourite hook shot. But when Jersey’s George Knight miss-fielded a hard off-drive and the ball sped to the line Self snapped into form. A boundary to square leg off Newton was followed by a high, safe off-drive for four off the same bowler. He then hooked Carter to the boundary as the runs were piled on. Hunter joined in the spree with a six and two crashing fours to square leg off Carter. Time was running out for the local side by this stage. If victory was to remain a possibility so the batsmen continued to hit out with the result that the side was soon dismissed. Guernsey had taken 200 minutes to get their 178 runs. Jersey were left to get 179 to win in 145 minutes. Jersey failed, as stated, but it was a gallant failure. Hart, Self and Le Cocq all bowled fast and well and when off-spinners Barrett and Bisson took over the standard remained high. When there was a chance of Jersey ‘digging in’ one expected the captain Collenette to come on with his flighted leg breaks. As things materialised the batsmen were beaten without them. Jersey have been a little more powerful on the cricket field for some years now. That is why this fine Guernsey victory was so popular. Guernsey-Jersey matches always carry that little extra interest as far as I am concerned, and being more than a little partisan, I must admit to feeling very happy about the cricket result at the College Field on Thursday. The Guernsey side deserves every credit for a thoroughly good performance. Strong in every department it was undoubtedly the better side on the day. There was no star performer in the side – indeed, one must look to the Caesareans to find the star of the match – but several played outstanding roles. Alan Bisson and Ian Lloyd paved the way for a good score after the early loss of Peter Burgess and, after Robin Roussel and Warren Barrett had put on some quick runs, Roger Self and Alan Hunter ensured a good score with some solid batting and, later, some free-scoring. The Self-Hunter partnership of 62 was certainly one of two extremes. At 100 for five Guernsey was not in a strong position – merely a useful one. Criticism was levelled at them for the time they took to settle in – Self especially – but they were justified as it turned out for half of the runs in the stand came in the course of two or three swashbuckling overs. After his indifferent ‘showing’ of late Self must have revelled in his return to form. Hunter must also have been well-satisfied for it is some years since he played an innings of such value. He has, of course, been missing from the cricket scene for nearly all this time. The Guernsey bowlers, Martin Hart, Self, Pierre Le Cocq, Barrett and Bisson, all did well, as expected. Captain Vernon Collenette never saw the necessity to use his leg-spinners. It was only at fielding that the Guernsey players did not shine. Lloyd, Bisson, Collenette and wicket-keeper Bill Druce all missed what seemed to be quite easy catches. But Lloyd at least made up for his error with two sparkling catches – in the gully and at slip – late in the Jersey innings. And the general standard of fielding, these misses excepted, was high. The star of the match, I thought, was Jersey’s David Grantham. He bowled his medium paced deliveries very well and his batting was also good to watch. Brian Le Marquand also gave a fine all-round performance showing up well as a wicket-keeper and batsman. A third Jersey star was Vic Newton who bowled well without a great deal of success and hit a good-to-watch 21. Jersey’s batting lacked the expected consistency. Nevertheless, the Caesareans played their part in a very good day’s cricket. 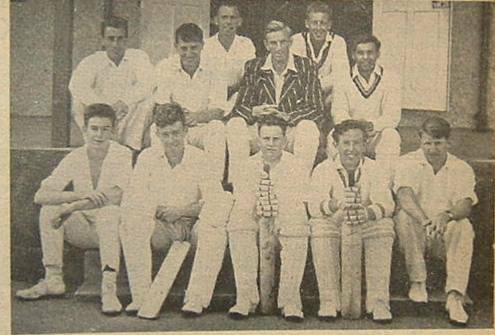 Before the start of this match Barrett and Burgess were awarded their Guernsey Cricket League caps.